I was in Jimbocho, the second hand book district of Tokyo. A whole district of the city filled with book stores. Mostly Japanese books, but I now knew quite a few stores selling books in English as well. As a book lover I was loving it. I always come for a visit when in Tokyo. I decided to look for a bar, somewhere to sit down and browse through my latest purchases over a nice, cold beer. I have not been to many other places than book stores in Jimbocho yet. Usually I have to just leave the place after an hour to keep my credit card from catching on fire. This time it seemed I could constrain myself. I started walking down the street in search for a bar. 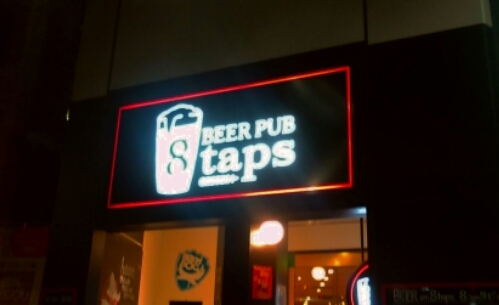 8 Taps Beer Pub was easy to see. A huge neon light was hanging over the stairs leading down to the bar in the basement. The sign beckoned me closer, to come down the stairs. Sit down in the bar. Have a beer. I could not resist. Crossed the street, descended the staircase. Entered, found a seat at the bar. 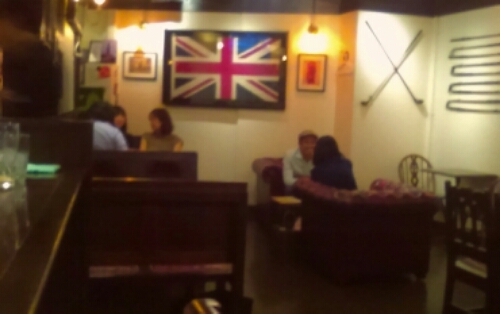 8 Taps Beer Pub is decorated like a typical british pub. Wooden walls, fittings, painted in brown and green. Wooden furniture with green leather chairs. Pictures of Churchill, the queen, Big Ben on the wall. 8 Taps looked like countless bars around the world. Trying to replicate that British feeling, but never quite making it. 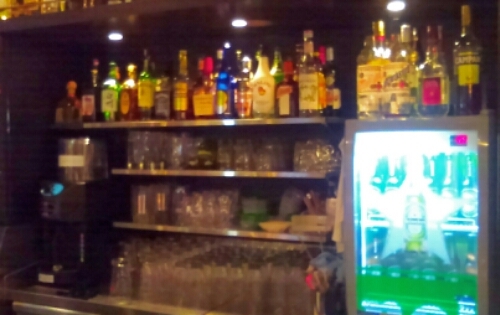 This is the kind of bar salary men in Japan go to, people come here after work to relax, unwind, have some fun. Drink some beer and eat some pub food. There are a lot of places like this in Japan. It was still only 6pm, quite early. The place was empty, people were still at work I guess. I ordered one of their Guest Beers at the moment, a King Kitty from Coalition Brewing Company. While waiting for the bartender to fill my beer, I noticed the bar is smokeless. A rarity in Japan. You can still smoke everywhere here, a habit hard to change. With the Tokyo 2020 Olympics coming up, the government is concerned how tourists will take to this. Smoke-free bars have been the norm for a long time in most western countries. Many solutions on how to solve this has been put forward, from a complete ban to having foreigner-friendly smoke-free bars as well as normal bars where smoking is allowed. So far I have noticed no changes to smoking in bars and restaurants, it is pretty much done everywhere in Japan. 8 Taps went against the rest, banned smoking and put a smoking room in the back for those who needed a fag. As my beer arrived I got out the books I had bought, old books about Japan, some of them over a century old. I could not wait to take a better look at them. What I love about Jimbocho is the selection of old books about Japan. There are a few stores selling books in English, and if you do a bit of searching you can find books up to 150 years old, at very reasonable prices. One of the books I bought was an old Guide Book to the country. Published in 1933 by the Japanese Government Railways. It was beautifully done, with several coloured maps throughout the book. This book described Japan as it was descending into militarism, nationalism and eventually the Second World War. I could not wait to read it. I also bought an old book about Tokyo, a book about the Meiji Restoration, two introductory books to Japan from the beginning of the 20th century and a book about Japanese literature. I laid all the books out on the bar, looked at one after the other. Very satiesfied with today’s catch. It did not take long before one of the bartenders came over to talk with me. He clearly shared my love of books. Soon we were both browsing through the books, discussing them. Talking about other books we liked and had read recently. Jimbocho must be the way to go to talk about books over a beer, I decided I had to return some time. Get to know the area a bit more, not just its book stores. The place was starting to fill up. I ordered another beer. When I had to leave, it was time to catch the metro back to Shimokitazawa to meet my friend, the place was almost full. All tables were taken, only a few seat at the bar were empty. Just as I though, the patrons were mostly salary men. all dressed in suits, tired after a long day at work. Eating and drinking like there was no tomorrow. I paid my bill, said goodbye to the bartender. Walked up the stairs and into the streets of Jimbocho. The metro station was only a block away.